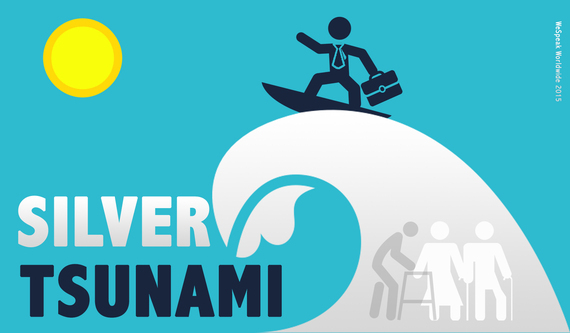 The Silver Tsunami refers to the take-over of an aging workforce. By 2020, 25 percent of the United States workforce will be comprised of workers age 55 and older (The Bureau of Labor Statistics). For the first time in history, there will be four generations of employees in the workforce. Older Americans are coming out of retirement, opting out of retirement all together, and people are living longer. In 1950, there were only 2,300 people who made it to the age of 100. It is predicted that by 2050, there will be 601,000 centenarians in the United States alone and 3.6 million globally. Dr. James Johnson, Professor of Entrepreneurship and national speaker with WeSpeakWorldwide.com speaks to business groups throughout the United States as an expert on the topic of disruptive demographics. "We are in the middle of a profound demographic transformation in the United States," says Johnson. "When an aging population sets-in everything has to change." In the United States, there are currently far less 25-year-olds than there are 45 to 64-year-olds (2010 Census). If businesses want to survive, they have to stop the trend of hiring only endangered 20-somethings and start seeking out older workers to fill empty positions. Hiring workers in their golden years means making some changes for an aging workforce but don't let the gray hair fool you; today's older workers are often physically fit and able to handle challenges in the workplace with minimum accommodations. Older employees have invaluable work experience and work ethic. They are usually able and willing to mentor younger, less experienced employees. They can take on part time or seasonal work. In fact, some prefer it. They are reliable and punctual. Older employees have a serious commitment to work, and they are loyal. Many times, they already have established long-term networks of clients and contacts. Older employees might be set in their ways and sometimes are not as adept at new technology as their younger counterparts. They may need additional training and they may lack flexibility. They might be old enough to have one or more chronic diseases, which makes them more expensive when it comes to medical care and insurance. "Right now work organizes our lives, everything centers around work but in the future, life will organize work. If you have family members to take care of, you're going to have to squeeze work in," said Johnson. "We're talking about a change in living arrangements, family structure and alike that is going to usher all kinds of challenges in the work environment. We have to have work places that are far more agile and flexible than what we have today." Joanne Francis, age 63 worked for a large insurance company for over 40 years before she retired. 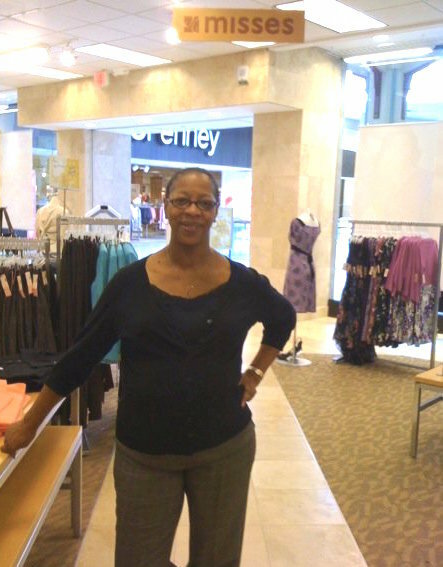 She came out of retirement and now works as an assistant manager at a popular mall clothing store. Flexible hours are key. "Baby boomers are dealing with a triple-whammy. They are dealing with their own mortality, elder care responsibilities [of an aging parent] and are [often] raising grandchildren," said Johnson. Businesses that offer flexible hours will benefit the most. Millennials, also known as Generation Y, value workplaces that encourage freedom and flexibility as well. It's a win-win for every generation. But what about the benefit to businesses? Businesses that offer flexible hours, retain key dedicated employees, gain increased productivity, decreased absenteeism, and decreased turnover, all which adds savings to the bottom-line (Entrepreneur magazine, 6/4/2006). "In the future, you have to figure out how to become the employer of choice," said Johnson. "Where everybody wants to work for you and nobody wants to leave." With 2020, right around the corner, businesses have to act now to implement the type of change that will keep them afloat when the senior super wave hits. Flextime & PTO. Allow a flexible work schedule and generous use of leave time. Telecommute. Allow employees the option to work from home. Job redesign. Create new positions or adapt old ones to better suit aging employees' skills. Retrofit workplace ergonomics. Consider implementing an age-friendly work environment. i.e. Instead of having overhead storage, put storage at eye level. Education. Implement training that will benefit older workers. i.e., technology-based education. Management training. Require aging workforce management training for supervisors and include education on managing a multigenerational workforce. Taskforce. Plan strategies for hiring and retaining older workers. When seeking a business example to follow, you don't have to look far. 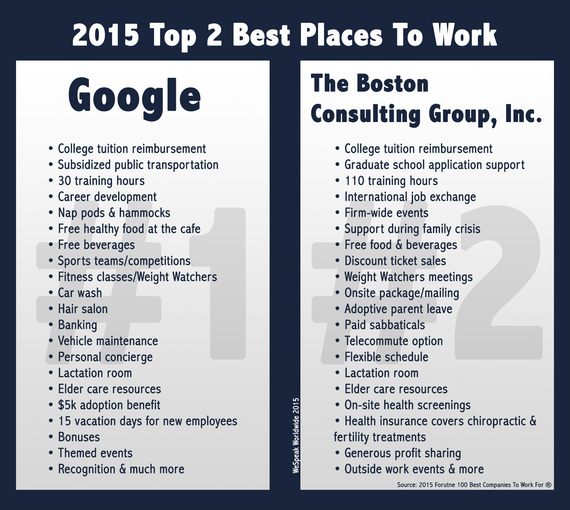 Just look at what some of the top companies are doing on the "2015 Fortune's Best Companies to Work For" list. The perks and benefits these companies offer, not only make an attractive work environment for older employees but attracts the best and the brightest of all employable age groups. 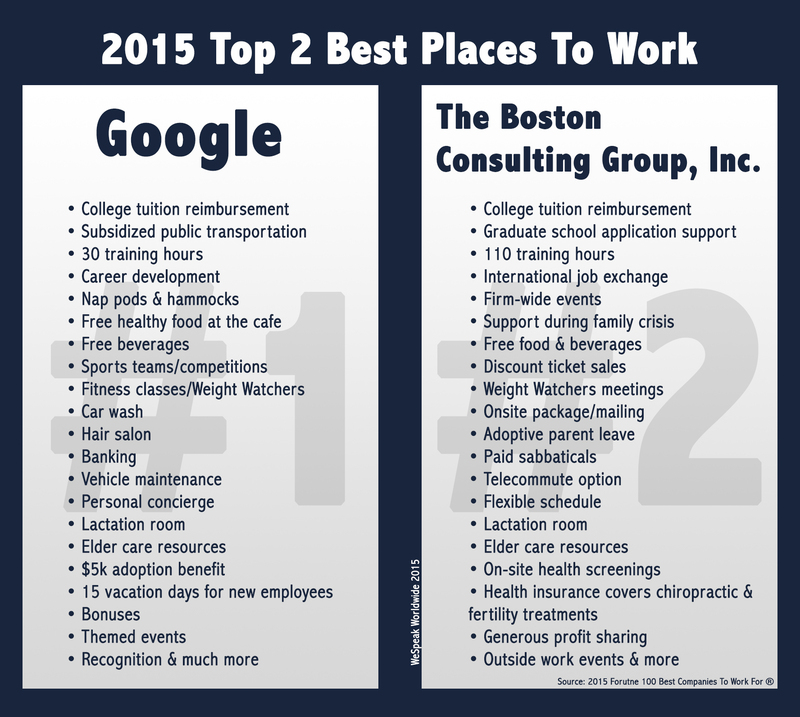 These companies not only have the best candidates to choose from but they retain the best employees as well. There's one common theme visible with the top companies on Fortune's list, each company is doing whatever it can to make life easier for their employees, which is attractive to both the old and young job seeker. Of course, every company can't afford to do what Google does for their workers but there are 100 companies on the Fortune's Best list, surely you can gain some ideas even if you start on a smaller scale. The workplace is evolving, hopefully for the better. Is your company ready to catch the wave? Janice Celeste travels and speaks at conferences on the subject of multi-generational management. You can find out more information at WeSpeakWorldwide.com.